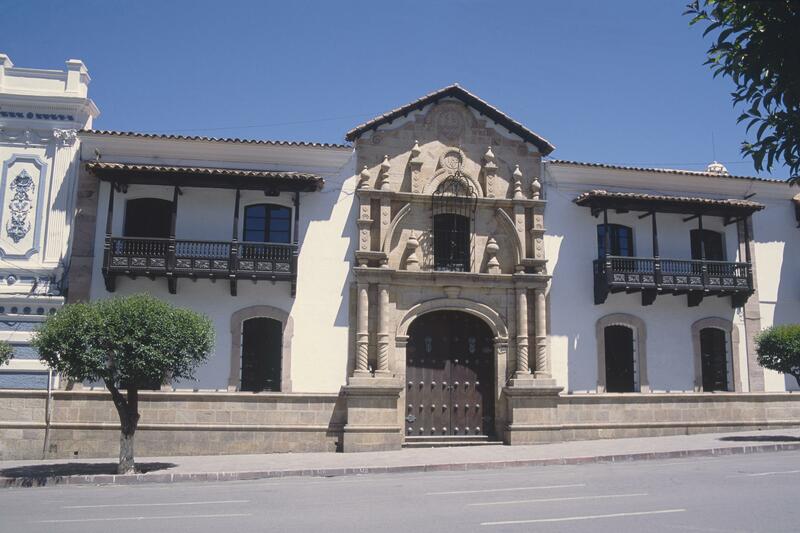 This building, once the Jesuit university, Universidad Pontifical de San Francisco Xavier, was training ground for key revolutionary figures, and home to the signing of Bolivia’s first constitution. Parts of the building date from the late 17th century, although much has been rebuilt and refurbished since then. The façade, however, is colonial in date. 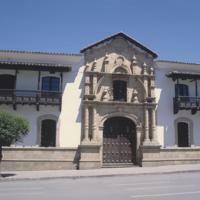 The main portal of the façade today leads into a museum, dedicated to the history of the Bolivian nation. In the roundel at the top of the portal, one can see the emblem with the initials IHS. It dates to the days when this building served as a Jesuit institution. The primary universities in Spanish America were, like this one, under Jesuit supervision until 1767, when the Jesuits were expelled from Spanish America. Originally built as a Jesuit university, this building was the place where the first constitution of Bolivia and the new nation’s first laws were approved. Today the Banco Central de Bolivia maintains the building, and it houses a museum dedicated to colonial history and national independence. The history of Casa de la Libertad, first as university in the 18th century, then site for nation-building events in the early 19th century, makes clear the strong impact of Jesuit-run educational institutions, both across Spanish America and in the new nations born from those colonies.